Synopsis: Renowned scientist Janos Rukh (Boris Karloff) demonstrates his newest discovery to a disbelieving group of savants, including Dr. Felix Benet (Bela Lugosi). In a somewhat surreal and complicated sequence, he reveals that all light and sound waves are preserved in space and time, and that looking back far enough he can see the moment millions of years ago in which a meteor containing an ultra-rare element called Radium X fell in southwestern Africa. Radium X, as the name implies, is a souped-up form of radioactive material, possessing great potential for both healing and destruction. Somewhat baffled but convinced by his demonstration, the scientists join Rukh on an expedition to recover the meteorite. In Africa, Rukh works obsessively to unlock the secrets of Radium X. Meanwhile, Rukh's beautiful young wife (Frances Drake) begins to fall in love with another man on the expedition (Frank Lawton). Most of the party returns to Europe. Dr. Benet quickly discovers that Radium X, applied properly, can cure any physical ailment, and he uses it to heal the sick, though he assiduously credits Dr. Rukh with the element's discovery. When Rukh returns home he learns of his wife's infidelity and of his rivals building new careers on his work. Comments: The third of Universal's Karloff - Lugosi screen pairings, The Invisible Ray is a curious little misfire of a movie. It begins with an unlikely and convoluted science-fiction premise, becomes a jungle movie in the middle (lots of white men in pith helmets and "African natives" pounding on drums), then sprints through the third act with a revenge subplot reminiscent of James Whales' The Invisible Man. None of these story elements fit together very well. The African expedition subplot, presumably added to make Radium X seem more exotic and unobtainable, doesn't add to the story and could been cut out; Rukh could just as easily (and much more credibly) have discovered it in his laboratory. The movie still might have succeeded with a strong director and engaging cast, but that was not in the cards. Lambert Hillyard, who cut his teeth on B-westerns and serials, seems uncertain of his material here and wastes a number of opportunities to build suspense. And while Karloff and Lugosi do fine in their respective roles (as a mad scientist and a philanthropic doctor) Frances Drake and Frank Lawton are crashingly dull as the romantic leads -- so much so that you wonder how they ended up in a major studio release. Add to this some special effects that would have been unimpressive even in 1936, and you're left with a standard-issue mad scientist flick from that era, almost aggressively generic and almost immediately forgettable. Still, it's always interesting seeing Karloff and Lugosi on-screen together, and Karloff's death scene alone is worth the price of admission. 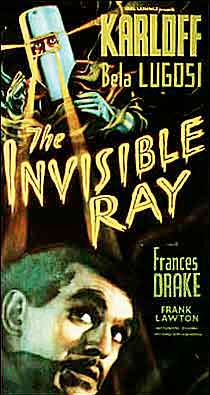 THE INVISIBLE RAY is my favorite of the Karloff-Lugosi teamings of the 30's. 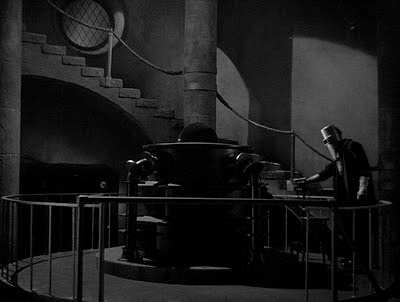 This was the very first of Karloff's many mad scientists, while Lugosi again proves to be an excellent scene stealer as the benevolent doctor (it is indeed quite rare when a Bela death scene is a tragic one). Scripted by the same John Colton who previously supplied an identical faithless wife subplot for WEREWOLF OF LONDON, where Valerie Hobson's unsympathetic performance paled in comparison to Frances Drake.